Originally posted by creator of the Vision Council Katherine Allen on her blog “the accessibility portal” on April 12, 2016. Dora Rush is a member of The Vision Council —an advisory committee to Common Touch, a multimedia exhibition of new works by artist-in-residence at the Library Company of Philadelphia, Teresa Jaynes. 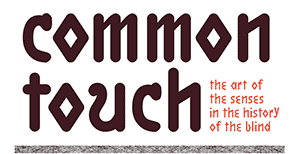 Common Touch explores the nature, foundations, and limits of perception through the juxtaposition of Jaynes’ multisensory artwork with historical materials documenting the education of the visually impaired in the 19th century. Rush is Director of Accessible Technology at Lighthouse Guild (formerly Lighthouse International). She joined the Development Office of LHI in 2001 following a twenty- year career in the apparel industry. Rush is a member of the Foundation Fighting Blindness NYC Chapter Leadership Group and serves on the board of the Association for Macular Diseases. Rush is an early adopter of technology that helps those with vision loss and speaks, writes, and consults on accessible technology and oversees the Information & Resource Service that provides answers to a wide array of inquiries about vision loss from around the world. Rush became visually impaired as an adult. Look for Dorrie on the road and behind the wheel of a high-tech, self-driving car just as soon as she can! In her capacity as a member of the Common Touch Vision Council, Rush spoke to Common Touch artist, Jaynes, about her experience as someone with vision loss. Follow me on twitter: Katherine L Allen @not_quite_blind.